Post updated 23/4/2015 – scroll to the end to see new analysis. If you haven’t been following the world of Google and its constant tweaking of the famous algorithm that analyses and sorts billions of web pages you could be excused for not knowing about the biggest change to happen to search in years. On April 21 Google will be rolling out a new update that will have a major impact on search results. It has already picked up the attractive little nickname “Mobilegeddon” but what is it really all about? 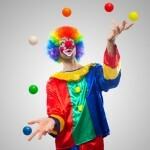 Let’s begin with Google’s announcement on the Google Webmaster Blog. There is only one way to read this – if your website is not deemed to be mobile friendly by Google by April 21 you will lose a substantial amount of traffic. Zineb Ait Bahajji from Google’s Webmaster Trends team was quoted as saying that this change will have more of an impact on search results than Panda or Penguin. Whatever percentage that actually means, this is a big deal. Unusually for Google, they not only gave people almost 2 months to take action they also supplied guides and a testing tool to help with the process. This all sounds perfectly reasonable and is unlike the way Google has covertly released most of their previous major updates. However, getting websites compliant is a significant and often expensive task. Add to this the confusion around whether separate mobile sites, making a current site responsive or going for a whole new responsive website is the preferred option and we have a whole lot of turmoil out there. To cap things off there is conflicting information from Google’s own tools – the testing tool may give a perfect score while Webmaster Tools gives a major fail. And even Google’s communications have been inconsistent. Before I dig down into the inconsistencies let’s take a look at the tool and talk about what your best options are if you fail the test. This is the result that you want to see. 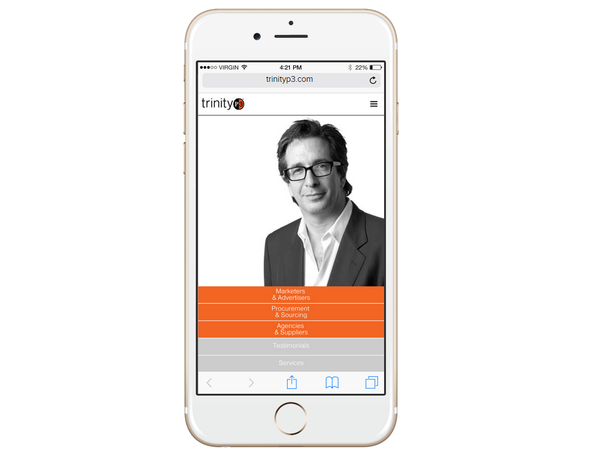 TrinityP3 went through a responsive design upgrade in 2014 as a healthy percentage of people were accessing the site on mobile devices – particularly the blog content. The previous version of the site had poor mobile user experience. We have all experienced the frustrations of arriving at a site on mobile that has small font and that you have to zoom and scroll horizontally to read the content. Since moving to a responsive design the mobile bounce rate has dropped significantly (people leaving after viewing only one page) and mobile time on page has increased dramatically. Which is what you would expect. So, it is good to see we are getting the thumbs-up. Now try your own website. While you are at it run your site through this tool from BrowserStack. This allows you to see how your responsive website appears on a range of different devices: various iPhones and Galaxys, Google Nexus, Notes, Mini, Tabs, Macs and PCs. You can ensure that the website looks good on all size screens and many devices. 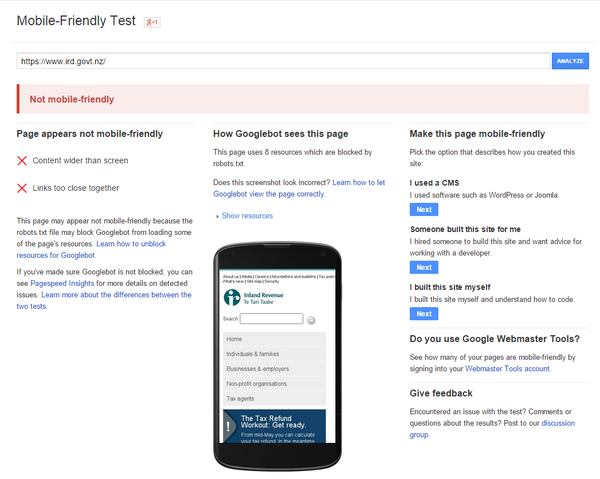 What if your website fails the mobile friendly test? Of course these all contribute to a poor user experience. You may be wondering why Moz, one of the biggest SEO sites on the web, would have a website that fails the test? This is very interesting. There have been several reasons given for Moz not having a responsive site when their raison d’être is assisting businesses in being compliant to Google’s many ranking factors and the tools they sell help with this process. Or it could be that they redeveloped last year, re-branded, migrated to a new domain all at once which was a massive undertaking and they simply don’t have the resources to go through it all again? What are your options if your website fails the test? There is conflicting information from Google about the best option. Responsive design was up until recently their preferred choice but they seem to have softened their approach and have now endorsed separate mobile sites as an option. So, let’s assume that Google is happy with either as long as the SEO is handled correctly and the mobile version gives good User Experience. What are the differences between the two options ? These are on a separate domain which means you have to treat them as if they are two completely separate entities – 2 lots of hosting and domain registration costs. So, if you have the budget for it I recommend going down the responsive design path. Do ensure that the mobile version is giving a really good experience for users, I have seen quite a few responsive themes that offer a horrific experience so choose wisely and test any potential theme on all screen sizes before committing to development. When don’t you need to make your website mobile friendly? Some websites (like the Moz example) do not have high numbers of mobile visitors. This will relate to the industry and the purpose of the website. No one is going to try to work through complex spreadsheets on a smart phone and some industries just do not have high mobile usage. 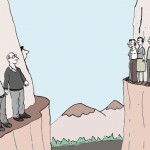 So how do you find out whether your audience is mobile or not? If you do not have Google Analytics tracking on your website you can get it for free here. All you need to do is go to your Google Analytics Dashboard and go to Audience > Mobile > Overview. You can see in this example that the website has had just under 42,000 visitors on desktop making up 77% of total visitors. Mobile contributed 9,764 visitors or 18%. In this case moving to a mobile friendly site would be critical. I am sure there are not too many businesses who would like to say goodbye to almost 10,000 visitors. This website has less than 4% mobile users. In this case you could build a good case for staying with the status quo at least in the medium term. Predictions are that all industries will see mobile search growth as people become more mobile in the way they do business and do their research. So it will be a case of delaying the inevitable. First of all, the mobile algorithm update runs on a page by page basis. 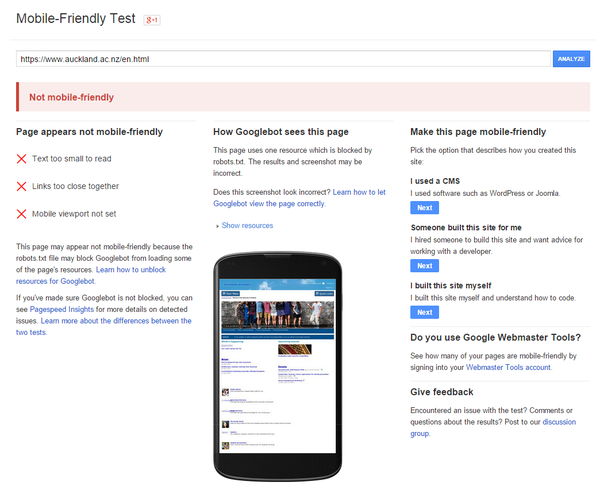 So putting your homepage into the Mobile Friendly Test will not give you the real picture. Websites have many different page types – home, blog, product, portfolio, page templates and many more. So you need to test each page type to ensure your entire site is compliant. 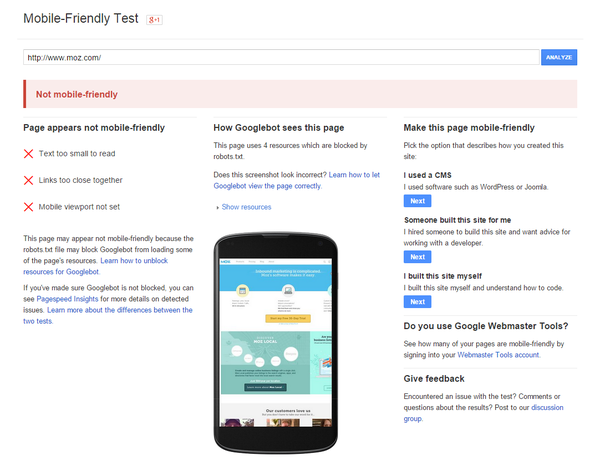 Google’s Webmaster Tools offers a page by page mobile usability test and the results here might surprise you. Unlike the Mobile Friendly Test the data held here is from the entire site so PDFs, images, newsletters and more may show up in these reports. For the TrinityP3 website we discovered a handful of old blog posts that had videos embedded in Flash, media library images that were too large (but are fine in the actual blog post) and PDFs of trade articles that showed up as having small font size. None of these are particularly useful in mobile search so it is not really worth the extra investment in making these responsive. The key point is that the main site pages and blog posts are in good shape. In this Webmaster Tools report there are also a number of other problem pages reported but when we ran them through the Mobile Friendly Test they are fine. So we are seeing some major inconsistency between the two different tools. Google has said that we should take the results of the testing tool as the best option as this is Googlebot crawling a page in real time. Are most major websites ready for the update? What will be very interesting in the coming weeks will be how Google treats large authority sites that are not mobile friendly. Portent tested the top 25,000 sites according to Alexa and the Majestic Million and found that 10,000 of them didn’t make the grade including a large number of Government websites. In my own testing I have found that the majority of New Zealand Government and University sites do not comply with the new requirements. Here is the conundrum that Google is facing. Obviously Google’s search results will suffer if the majority of Government and education sites are bumped out of mobile search. 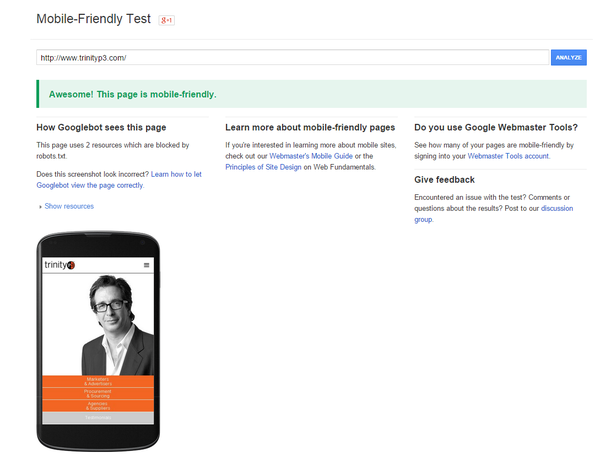 And if 10,000 of the top 25,000 websites in the world are not yet mobile friendly how does that help a mobile searcher? What sort of experience will Google mobile search offer a user if many of the biggest sites in the world are suddenly missing? The interesting aspect to track after this update goes live is how Google handles this. Is there a special dispensation for websites that have a certain domain authority? And if so what is the cut-off point? Or will it be based on the domain itself? Do .govt, .ac or .edu sites get treated differently to business sites? Google will be well aware of the long timelines involved with getting a Government or University site redeveloped. There is no way that these organisations are agile enough to turn this around within two months. It will be interesting to track the change in mobile visitor numbers across a range of websites to see where the impact is felt. I will return to this post over the next few weeks to update it with my findings. Good luck with your own websites. If you are not getting an “Awesome” on Google’s test then now might be a very good time to have a conversation with your developer. It is now April 23rd and we are starting to see some movement in results around the web. 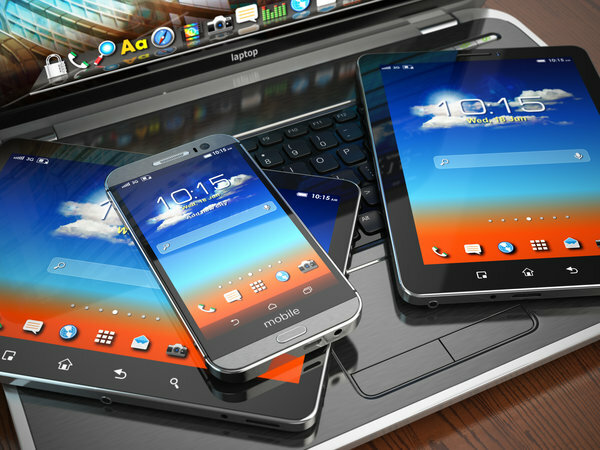 Has mobilegeddon been the terrifying game changer that some media has been predicting? The NZ Herald even published a totally inaccurate post trumpeting a stance that a large number of New Zealand businesses would be “banned” from Google. Come on people… please! Take a deep breath! No, the sky has not fallen in but we are beginning to see some subtle winners and losers. A day after the event Search Engine Land writer Barry Schwartz was asking whether the update had even rolled out as his data was not showing much movement. He did pick up a switching of number one and number two results between a mobile friendly page on Wikipedia and one that was not mobile friendly from Moz who I discussed earlier. Mozcast is not picking up a great deal of volatility. Mobilegeddon seems to be fairly low key so far with only a slight movement in mobile search. This may be to do with the slow roll out or it may be that everyone including Google may have over-emphasised the impact. So how are the sites I am tracking performing? A couple of sites that are far from mobile friendly have dropped a little but this is far too early to tell whether this is part of the usual range of fluctuations or is tied to the update. To cloud things further Google seems to have finally identified and eliminated a number of problem “referral spam” sites which is impacting numbers. The majority are seeing a slight lift over the past couple of days but again this is too early to say whether this is a trend or not.